NEW YORK - US stocks surged on Wednesday, rebounding from steep losses, as investors snapped up beaten-down financial shares amid talk of help for mortgage insurers and some optimism returned to the market a day after the Federal Reserve's emergency interest-rate cut. The S&P 500 financial index had its best day in 5-1/4 years as investors reversed bets of the last few days and decided recent declines went too far on the back of the Federal Reserve's surprise 75 basis point rate cut on Tuesday. The rally caused safe-haven government bonds and the yen, which tend to rise as investors pare risky trades, lose ground, though commodities, including oil, sagged on nagging fears that slower global growth will hurt demand. "The speculation that mortgage insurers could potentially get a bailout helped the market stabilize. That was enough to get the market going. There was no real silver bullet news that came through," said Joe Saluzzi, co-manager of trading at Themis Trading in New Jersey. Shares of top bond insurers MBIA Inc and Ambac Financial soared on speculation of capital infusions, with MBIA up more than 30 percent and Ambac up around 70 percent. Other financial shares posting strong gains included investment banks JPMorgan Chase &Co and Bear Stearns Cos, jumping more than 10 percent each. The Dow Jones industrial average was up 299.31 points, or 2.50 percent, at 12,270.50. 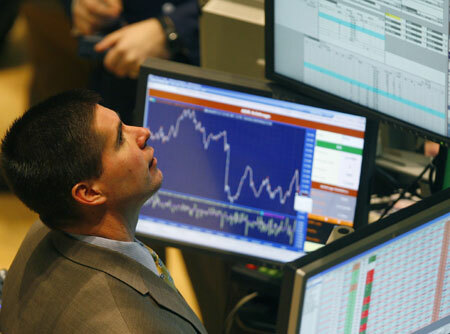 The Standard & Poor's 500 Index was up 28.08 points, or 2.14 percent, at 1,338.58. The Nasdaq Composite Index was up 24.14 points, or 1.05 percent, at 2,316.41, although losses in iPod maker Apple Inc dragged on the index. Earlier, stocks were hammered by persistent worries about a US recession. European stocks closed at their lowest level in 1-1/2 years on Wednesday, as fears of more mortgage-related write-downs again hit bank shares. The Fed on Tuesday slashed its key federal funds rate by three-quarters of a percentage point -- the largest cut in more than 23 years -- to 3.5 percent a week ahead of its scheduled policy-setting meeting, underscoring the risks facing the US economy. Investors were still unsure how far Wednesday's rally would go, believing a lot more needs to be done by the US central bank to shore up the US economy, which some see on the brink of recession, hit by a slumping housing market and tight credit. Markets have priced in a further half-point rate cut at next week's Fed meeting. After rising as much as 1.6 percent, the FTSEurofirst 300 index of top European shares closed down 3.22 percent at 1,262.40 points. Worries about profits and bad debt write-downs took a toll on banks such as Societe Generale. Asian markets managed gains earlier in the global session, with Japan's benchmark Nikkei rising 2 percent. Analysts said the gains in Japan could have been due to the 16 percent decline in the Nikkei this year, which made the index more than due for a rebound. Commodities remained vulnerable as recession fears gripped markets. Copper was down slightly on the London Metal Exchange, while US crude fell more than 2 percent to $87.30 a barrel. "The Fed's move implied that the problems in the system are much worse than we expected," said Eugen Weinberg at Commerzbank in Germany. The recession fears had earlier fueled safe-haven buying of US government bonds, sending US Treasuries higher and pushing the benchmark yield briefly to its lowest level since June 2003. But as the stock market recovered, the benchmark 10-year Treasury note's price traded with a yield of 3.40 percent, just down from the 3.42 percent it yielded late on Tuesday. Earlier it had dipped below 3.4 percent for the first time since mid-2003. The 10-year Bund yield slipped to 3.91 percent. Bond yields move inversely to prices. The rebound in stocks came too late for foreign exchange investors though the dollar was off the session lows. In the currency market, the dollar shed 0.3 percent against the yen to 106.04 on the day, while the euro slid 0.4 percent against the yen. Falling stock markets are typically seen as a sign that investors are wary of taking on too much risk. In currency markets, this translates into selling higher-yielding units for low-yielding currencies like the yen. Man on moon. Now, woman on Mars?